Just because you don't suffer from kidney stones doesn't mean you don't have a problem. Kidney sludge may not be painful passing out the ureter, but it is nevertheless deadly over time as it slowly chokes off kidney function nephron by nephron. How extensive is the problem? Virtually, every living person has some degree of sludge build up and some loss of kidney function over time. The only question is how much. Does it reach the point where it causes painful kidney stones to form or the point where it chokes off a critical mass of kidney tissue, ultimately leading to kidney failure? In fact, 26 million American adults have kidney disease -- and don't even know it. 26 million American adults have kidney disease -- and most don't know it. Fortunately, it's good to know there are ways to keep your kidneys healthy to avoid going down that road. It is also important to remember that keeping your kidneys properly functioning is not just to avoid disease, but to help them do their job. Did you know that every 30 minutes, the kidneys filter all your blood in your body, removing waste and excess fluid? They also help regulate blood pressure, activate vitamin D, and keep all your minerals in balance such as sodium, phophorus, and potassium. Paramount to good care of the kidneys is reducing the toxic load they have to deal with, especially proteins and chemical contaminants which can build up in the kidneys, slowing their function, increasing acidity and raising blood pressure. 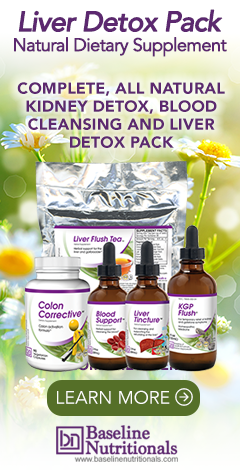 According to Jon Barron, "The regular use of a kidney detox is now mandatory considering the stresses we put our kidneys under, thanks to our 'modern' lifestyles."